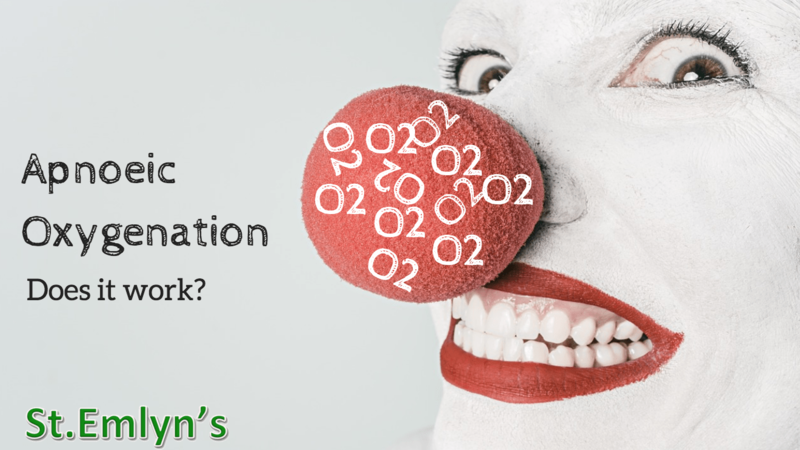 We’ve debated Apnoeic Oxygenation on St.Emlyn’s in the past1. Physiologically it kind of makes sense. The idea that we can put ‘Os up the Nose’ (as someone cleverer than I suggested) to avoid premature or untimely desaturation is both attractive and simple to do. Most commonly this means placing some nasal specs on a patient undergoing emergent intubation, and then cranking up the oxygen flow in the apnoeic period between the drugs going in and intubation and subsequent ventilation. It’s quick, cheap and easy and so it’s been fairly widely talked about and adopted by many people I know. Importantly, there have been caveats out there. It sounds great, but the evidence is really theoretical rather than evidenced in real world clinical studies and I think we accept that. Personally I have used it, but not on every patient. I’ve focused on patients whom I suspect will be difficult. Now I’ll admit that’s a fairly weak ‘evidence based’ position, but I’m being honest with you. Back in 2015 Janos reviewed the FELLOW trial here 1,2 which was an RCT in the intensive care setting. It did not show a benefit to AO and thus doubts started to be raised. However, ICU patients are not like ED patients and so the jury was still out on this. It certainly raised questions back then in our minds. So what’s been published now? This month we have a new RCT looking at AO in the ED setting3. This looks to be what we want, a paper in our population looking at the potential benefits of AO amongst patients that we see here in Virchester. The abstract is below, but as always please make sure that you find time to read the full paper. This is a randomised controlled trial which is spot on for a therapeutic trial. Patients were randomised either to having 15L/min through nasal canullae or not. Pretty simple design in all honesty, which is great. Oxygen sats were meaured throughout with apnoea time being measured from the point of the laryngoscope entering the mouth to ETCO2 being seen on the monitor. That all seems fair enough to me. Cleverly they recorded all O2 sats using a remote observer as a way of introducing a degree of blinding into the study as it was clearly impossible to blind the clinicians at the bedside. Tell me about the patients? The patients seem like the usual mix of trauma, toxicology and medical patients that we see in the ED here. Although this is an academic institution and trauma centre (and a single centre trial) it seemed familiar enough to Virchester to be relevant to my practice. What about the main results? The primary outcome measure was the lowest average oxygen saturation during intubation, and for 2 minutes after that. Secondary outcomes were hypoxia, first pass success etc. 206 patients were enrolled. There was no difference in lowest mean oxygen saturation between the two groups 92 % (CI 91 to 93) in AO vs. 93% (CI 92 to 94) in usual care, p=0.11. There were also no differences found in the number of patients with hypoxia, but these rates were low. Not at face value. This is an RCT (so good) of ED patients (excellent) looking at O2 sats (fab). Wait a second though. What are we really trying to prevent when we use AO? For me it’s the number of patients who become hypoxic, and as a way for me to buy extra time when times are tough. The patient who is going to be a tough intubation, or the one who has is difficult to preoxygenate for physiological reasons. Those are the ones where this might make a difference. In my practice very few patients become hypoxic when I intubate them, I would not be a very good EP if they did! Indeed, the numbers of patients with hypoxia is also very low and that’s a problem when we consider whether this study is big enough to be conclusive. The authors have chosen a different primary end point to the one I would have chosen. The average O2 sats is OK, but if the vast majority of your patients are not going to desaturate then you are very unlikely to find any difference unless the numbers are huge (and they are not here). The study appears to be powered to detect a 5% difference in O2 sats (using a two sided test – so either up or down), and yet in the usual care group the average SaO2 was 98% at the point when AO was started (in both groups in fact). Since we’re not going to get to 103% with AO (!) I guess that means that we would be trying to detect a decrease in O2 sats in the AO group down to 93%. That’s just not going to happen, in fact I don’t think it can happen with these numbers of patients in the trial. In other words if we are looking for a difference of 5% using this method then we are very unlikely to find it. Apologies if that’s a bit nerdy, but it’s important. Hang on though, what about the patients I’m interested in? The difficult and scary ones where every second counts. Are they in this study, the answer is probably, but 18 patients were excluded because they did not have a 3 minute period of pre-oxygenation. It is possible, but not known if they represent some of those tricky patients. For me, the key numbers are those patients who do desaturate and whether there is a difference between the two groups. Roughly 20% of the patients desaturated (< 90%)in this trial and there is no statistical difference between those numbers as it’s too small to detect a clinically important difference. I think 20% is pretty high to be honest, but although the patients look similar to Virchester in table 1, I don’t really know the patient mix here and it may be due to that. So is this definitive evidence? I don’t think it is either way really. The bottom line is that amongst a group of patients who ordinarilly don’t desaturate then we are going to need a fairly large trial to detect a real difference. Back home in Virchester, the jury remains out. It’s great to see another EM trial on an important subject, it certainly adds to the evidence, but like many trials we are still left with some questions. I quite like John Sakles views on this (follow him on Twitter) and read the excellent accompanying editorial in the journal4. That editorial links a whole range of studies including some recent review and meta-analyses5,6,7 8, to come to some sensible conclusions. Plus there are other papers around too including some in prehospital care9. I’d recommend John’s editorial as required reading for anyone interested in this area. We remain in evidential limbo. There is little apparent penalty to AO, and there is evidence around that it decreases the time to desaturation in some studies, but not in this one. There is a theoretical and case report downside in that it may interfere with pre-oxygenation and there are case reports of harm. I suspect that it will remain in the Virchester armementarium for special cases and special days, but it’s unlikely to become ubiquitous amongst the sceptics amongst us. Personally, I’ll be using it more often than not (as it’s trcky to predict the unpredictable difficult airway), but I do appreciate that this is an evidence light decision for my practice. Apnoeic Oxygenation. St.Emlyn’s. http://www.stemlynsblog.org/apnoeic-oxygenation/. Published December 2017. Accessed August 15, 2017.